I don’t know about you, but when I found myself searching to replace my old food processor, I kind of hit a wall. It’s so easy searching for the best blender compared to this, all sources unanimously point to the Vitamix, with the occasional JTC OmniBlend mention (or a Nutribullet for a cheaper and smaller option), but when you search for the best food processor, way too many results pop up. So I decided to do the research for you! After looking at countless reviews and videos (even searching other raw food chef recipe videos and trying to guess the processor make from them! ), I have finally found one that stood out. Below I made a video to show you the best features of this processor, as well as give you two very easy recipes for you to try at home – zucchini rolls and raw brownies! What do you use a food processor for? When I was eating cooked food, I never really used a food processor, we did have one in the house but I was too young to remember what my mum did with it. When I went raw, in 2011, I had no idea on what equipment to buy, so I was really missing out by only having a hand blender!! It wasn’t until a year into it that I finally decided to get a processor, and gosh did my life change after that! I could finally do so many raw vegan recipes at home and have the variety that most people lack at the beginning because they simply don’t know what you can make or don’t have the right equipment! In short, you can make thicker sauces with it, unlike a blender where you just turn everything into a smoothie. For example, you can make pesto, or tomato sauces for a raw lasagne/pasta, or hummus, or even smooth almond butter if you have the patience for it (I sure did when I discovered you can make almond butter at home!). The knives are longer and spread further apart than in a blender, allowing you to keep some texture or chunks in what you are preparing, making it a very useful tool for sooo many recipes – just think of how a raw cake is made, the base is most likely done in a processor to keep it a little chunky. Also, a typical food processor has a series of disks that you can use to chop or grate vegetables in a variety of different ways. There is a chute at the top where you can feed the vegetables in, and they get sliced on the way down. I didn’t use it to it’s full potential for the first 3 years… I had no idea why anyone would want to use the cutting disks, so I just stored them in a box somewhere far away, the chute was far too small to do anything useful with it in my opinion, and I made less mess by using a grater. With the latest processor I got, I finally began to see why you have all those disks! I’ll tell you why in the features list below. 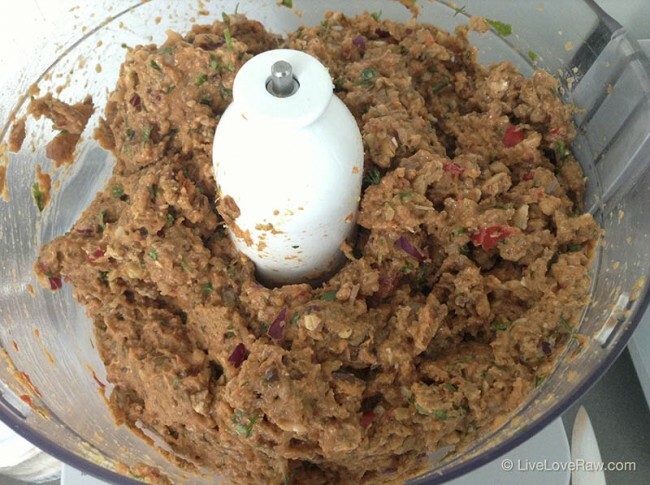 So what is the best raw vegan food processor? For me personally, the processor that best suits my needs is the Breville Kitchen Wizz Pro (or if you’re looking in the UK, it’s called Sage Kitchen Wizz Pro). What are the features of the Breville Kitchen Wizz Pro? It has a huge feed chute – 14cm! This basically allows you to put a whole cucumber, or half a zucchini in to cut slices or grate them lengthwise, in order to produce longer strips. These can be used to make lasagne slices, carrot salad (I always struggle to use a hand julienne peeler or a spiraliser on them! ), or even use the “chips” cutter to cut veggies into thicker strips for dips! You could also stick 3 carrots in it upright to grate them smaller but all in one go. Alternatively, there is also a small feed chute if you want to stand just one carrot upright, which doubles up as a measuring cup. It has TWO bowls – a smaller one (600ml wet and 1 litre dry) inside the bigger one (2.5 litres). This is probably the main reason why I got this processor! One thing that often put me off making food for myself at home before, is that if you need to only make food for yourself, you will still have to put a large amount of food into the processor for it to actually work. Raw food is best fresh, so you don’t want to keep a bowl-full of sauce in the fridge for days. The smaller bowl really changed my world, as you can finally make small amounts of food…and less to clean too! On the other hand, if you’re making food for a party of 10 people, the big bowl is large enough to allow for that too! It has quad blades! Probably the second reason why I was attracted to this processor. At my last raw food workshop I was demonstrating how to make raw crackers, I filled my old processor up with all the ingredients and then we all laughed at how the poor thing was struggling and violently shaking to try and mix it all! Not only is it amazing for helping you run a lot of food in one go (don’t have to use the spatula as much to scrape down the sides! ), it’s also incredibly sturdy – no shaking at all! 2000W induction motor! In other words, this thing is a beast! Super powerful, strong and reliable – it’s even under warranty for 25 years! Adjustable slicer disk with 24 settings! This thing is just awesome, it basically replaces a mandoline for you. You can choose how thin you want something to be, from 0.5mm to 8mm, and it will slice it in seconds! Perfect for making lasagne slices, zucchini rolls (see the video above for the recipe! ), or even if you just want your tomatoes sliced into perfect circles. No more cutting yourself on a mandoline… Click on the picture to see how to use it. It’s super quiet! Not sure that’s the technical term for it, but honestly, it’s the quietest machine I currently have in the house, it was actually quite weird at the beginning, I thought something was wrong with it, haha. It has a timer. Ok so maybe it’s not the most exciting feature, but if you want to leave it running for exactly 5 minutes and go to the toilet in the meantime, you can easily do that now. If you don’t wish to set the timer, it will still tell you how long it took to process something. It has a great accessory box. The box is very comfortable to store (it has 2 positions) and is very well organised inside. There are labels for all the blades and disks, and there’s even a safety holder for the quad blades. The disks and accessories include: fully adjustable slicer, quad blade, mini blade for the mini bowl, julienne blade, chipping blade, reversible shredding blade, whisk disc, dough blade. The last 2 I haven’t figured out what I could do with yet – if you find a creative way to use a dough blade and a whisk for a raw food recipe, please leave a comment below! Can I get the Breville Kitchen Wizz Pro in my country? When I first read about it, I was a little sad because I didn’t see a way you could get it in Europe, they don’t make it obvious that in Europe they renamed it to “Sage”. You can definitely get it in the US and Australia under the Breville name, and in Europe you should search for Sage. I live in Spain and got it on the UK Amazon, which took only 5 days or so to arrive. Usually German sites work best for delivery to Spain, but this one was a little harder to find, so I would recommend getting it from the UK. I’m just getting into raw food, should I get this food processor? If you have 600€ to spare, then of course, better get the best you can to give you the best options possible! This is my old Kenwood food processor – as you can see it’s nothing fancy, the little stick there falls off every time and it shakes when making too much food, but it’s still quite strong and does the job for a very good price! For a beginner I would highly recommend something like that, as you will get 3 in 1 and the small coffee grinder is fantastic for making small amounts of liquid sauce or smoothies (honestly it’s the only feature I miss now!). For a raw food chef, it is important to have a great machine so it will live long and do all the things you want it to do, that’s why I spent the time and money getting something that will last, but you just need to look at your needs and what you can afford at the moment to decide on the perfect machine for you. In reality, there is no “best processor” – the Breville is the “best” for me right now, but for your “right now”, it may be something else (Cuisinart is mentioned a lot, for example). Here’s another Kenwood processor I had brought with me to Bali (can you believe this is the BEST one you could buy in El Corte Ingles in Spain?!?!) – it was only 750W and took 45 minutes (!!!) to make almond butter, but it was still better than anything they sold in Bali…and it was cheap, just check out that link. GREAT REVIEW! I think Breville should pay you to keep this online, what a well organised and thorough review! And I see so many people have bought it after seeing your video, I think I will get one too! Thank you! Hello Anya,just found this blog,I’m in a big search for a good processor mainly raw cakes and vegan food what I wiil use it for. I bought the Breville Kitchen wizz 11 plus and for my raw cakes I could hardly use it. The blades did not work on the dates i put in. I tryed soft ones and dry ones too. It does say in the booklet it won’t work unfortunately which I only found out sftet purchase. They say you need to put them in the freezer before. But I saw so many YouTube videos whete ppl used much simpler and cheeper processors for dates without any problems,like for example a raw brownie..
Hi, wow thats a shame! I don’t know the Wizz 11 plus, but the Wizz Pro works AMAZINGLY well for raw cakes, and I torture it to the max haha! Give thanks for such insight, my raw food preparation has always been focused on large portions becuase I love feeding people. LOL Please let me know how stable and reliable the breville machine’s blades are. Can they stand up to dry and heavy ingredients such a dry nuts and dry coconut meat? I had one machine for several years (cuisineart DLS5) but then the blade cracked and eventually broke off into the food. I dumped everything of course but need a commercial type quality food processor. Hello! Well I’ve had it for a year now, or even two, cant remember when I wrote the article, and I use it all the time for large quantities and nuts are my main ingredient. So far it’s worked perfectly, cant complain about the blades at all. I guess eventually any equipment starts to wear off, but so far I haven’t used a machine better than the Breville 🙂 Hope this helps, have a lovely Sunday! Thank`s for your reply, It was informative and made start to think if I really need both the food processor and a blender for my use (cakes, brownies, smoothie bowls etc) – puh! :-), it`s not easy for a new beginner 🙂 :-). I will have a look at the Kenwood you refered to again maybe that one is a good choice with both the blender and processor. I will let you know how I like my choice. Hi Anya! Thank`s for a good article about rawfood equipment. I`m still puzzled thoug, trying to buy my first rawfood machine. I have been thinking about this one http://www.rawfoodshop.se/omniblend-tm-767-i-2l-bpa-fri-svart.html and this one Wilfa PB-1200S. Do you know anything about them? Is a blender to small to use for making rawfood cakes, butter, milk etc etc??? I have heard good things about the Omniblend, I know some people who have it but I honestly never tried it myself, it would be my second choice after a Vitamix though. Never heard of the Wilfa though, sorry! The Omniblend should be powerful enough to make the toppings for raw cakes, but bear in mind that you will probably need a food processor instead of a blender to make more coarse things like cake bases or brownies. Thank you so much. I needed a new processor and do Raw so your information was fabulous. I appreciated the demonstration. I went straight out and purchased one and have already made lunch with it! so fast and sturdy. Thanks Christine! It’s just such a useful tool in the kitchen!